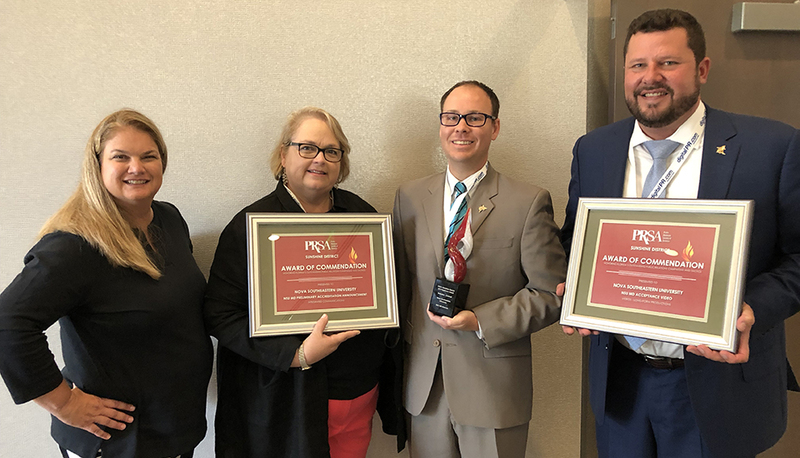 Congratulations to our colleagues at the NSU Dr. Kiran C. Patel College of Allopathic Medicine for their win of three Radiance Awards at the PRSA Sunshine District (Florida) Conference July 13th, 2018. The Radiance Awards recognize outstanding strategic public relations programs by Florida practitioners and organizations and highlight campaigns that demonstrate excellence in research, planning, implementation and evaluation, as well as those who have shown dedicated commitment to the profession. In attendance to accept the awards from Tony D’Angelo, PRSA National Chair; and (l to r in photo above): Christina Morton, PRSA Sunshine (Florida) District Chair; were Jacqui Hartnett, President, Starmark; Jeremy Katzman, Director of PR and Marketing Communications; and Brandon Hensler, NSU Executive Director, PR and Marketing Communications. Jacqui, Jeremy and Brandon also addressed 50+ conference attendees on the “Strategies to Effectively Communicate with Gen Z” in which they not only showcased NSU MD’s marketing plan to reach this influential generation, but presented case studies for higher education, and travel and tourism industries that have begun to penetrate this market.